Since I’m taking R2 to a Sci Fi convention in 2 weeks, and I won’t be able to receive the utility arms, or paint the droid before then, I started just testing how it would look with just a printed piece of paper in the utility arms section.. I also covered the piece surrounding the center vents with blue paper, just to test. it looks like a new droid now, and doesn’t really feel good to do a mockup like this, to be honest! I did however fix the remaining frames on the back and made the two long doors on the front. 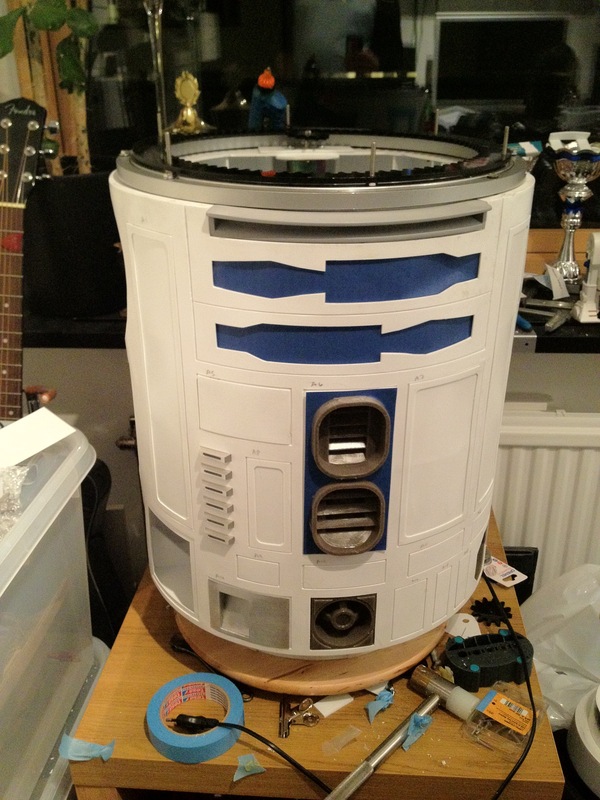 The resin parts, and the LDP are just fastened with melt glue at the moment. It is sturdy, won’t come off easily, yet can be removed when I want to!